For those doing some early season races or for those just wanting to get some early riding in while the weather is still challenging here at home, consider joining us in Maui. We have explored the island over the last 8 years and have found that Maui is a great location for training. Our base in Maui is central Kihei; close to fabulous beaches for some open water swimming, short walk to the open-air swimming pool and on the west coast to enjoy fabulous sunsets nightly. The 7-day camp (Saturday – Friday) will include lots of opportunities to swim, bike and run daily. We typically have an end of camp celebration such as a sunset sail the last evening (Friday) so plan to stay at least until Saturday. Swimming: Kihei Aquatic Center, an open-air public pool, is free of charge and we will take advantage of this great venue throughout the week. There will also be opportunities to do ocean swims practicing specific open water swim skills. Running: We can run north to enjoy some quieter roadways and beaches. A run to the south might include some hills around Wailea. Some will be shorter brick or transition runs, others will be longer runs followed by a stop at a local coffee shop. If there is interest we will also do some trail running or an ocean side run through the lava fields. For those looking for more deluxe accommodation, the websites above have more deluxe condos in their listings. Bikes: You are welcome to bring along your own bike, however with the hills on Maui we strongly suggest that you have climbing gearing on your bike. Also with the higher cost of transporting bikes on the airlines, you may want to rent. 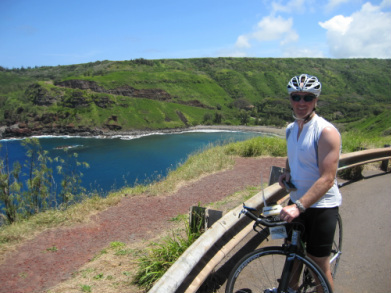 South Maui Bicycles has a wide variety of bikes in various sizes and price ranges. They are located right in Central Kihei. www.southmauibicycles.com. Price: for the camp is $750. Flights, accommodations and food are the responsibility of the participant.